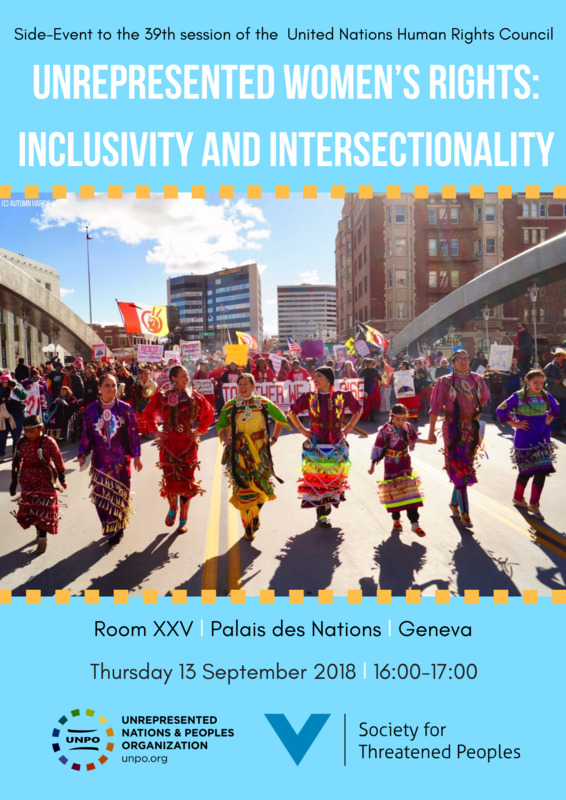 On the occasion of the 39th Regular Session of the United Nations Human Rights Council (HRC), the Society for Threatened Peoples (STP) in cooperation with the Unrepresented Nations and Peoples Organization (UNPO) will be organizing a side-event entitled “Unrepresented Women’s Rights: Inclusivity and intersectionality”. To fully address women’s difficulties, it is essential that societies look beyond the main aspect of a problem. Although all achievements in the name of women are positive steps, the success of privileged groups of women is not enough. The idea of sisterhood requires inclusivity and especially the inclusion of women from unrepresented nations and peoples. There is a need for more inclusivity for women activists not only in order to fix the ongoing gender unbalance within human rights organisations and institutions alike, but also to help overcome intersectional forms of oppression. Indeed, indigenous and minority women often have to decide whether they give priority to their identity as women or their identity as members of an unrepresented community. An activist is faced with the dilemma to either join the liberation or human rights movement of her community and try to educate her male colleagues about women’s rights or give up her identity and join a feminist movement that will not necessarily understand, take into account or even accept her national or human rights activism. This is not a decision that indigenous and minority women should be forced to make. To call on indigenous and minority organisations to encourage best practices in terms of gender equality and women’s empowerment by highlighting the necessity for inclusiveness. This event will put particular emphasis on the important role of women as actors of change, rather than as victims, as they are usually depicted. However of course, the specific forms of violence and discriminations they face will be mentioned as well. As human rights organisations dealing with various indigenous peoples and minorities from several continents and with different cultures and historical backgrounds, the UNPO and the STP vouch for the human rights of all, without any form of discrimination.